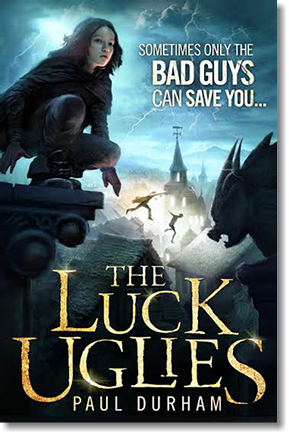 Mr Ripleys Enchanted Books: Mr Ripley's Guest Post: Paul Durham - The Luck Uglies - HarperCollins - Happy Publication! Mr Ripley's Guest Post: Paul Durham - The Luck Uglies - HarperCollins - Happy Publication! Dreams don’t come easy. I suppose they aren’t meant to. Since I was a child, my dream was to see my fiction published. Sometimes I wished I’d aspired to be an astronaut or professional athlete instead. That’s how difficult the road to publication seemed at times. I started my first novel nineteen years ago. It was heavy-fisted, testosterone laden stuff, filled with gritty characters and grimy settings. I labored over it for seven years until finally, finished work in hand, I braved the literary agencies’ slush piles. Most agents didn’t accept e-mail queries back then and the rejections mounted as fast as the postage. It had been months when finally, unexpectedly, an agent at a great New York agency agreed to represent me. Needless to say, this was an exciting time and soon the agent was submitting my work to publishers with much optimism. Then another unexpected thing happened. Rejections began piling up again. They came with promising words and invitations to send my next book, but the ultimate message was always “no thank you.” Eventually there was nowhere left to go. I joked that I had been read and rejected by every major (and not-so-major) publisher in Manhattan. I promised to get the agent my next novel, and over the next few years I did—in a sense. Fifty pages of one novel, a hundred pages of another. All of them stories started but never finished. With a wife, two young daughters, and a demanding career that already kept me away from them for too long, it grew harder and harder to justify even more hours toiling alone in front of a computer with the voices in my head. Finally, after so many stops and starts, I quit writing altogether. In the years that followed I focused on my family and my career, but a hollow remained. I found myself tormented by the fact that I wasn’t creating much of anything at all. Then, upon reflection, I realized that I was. Every day, with two little girls who seemed to be bitten at birth by the same creative bug that I had, I sketched and painted and told stories. Lots of stories. Late one fall, when my oldest was six and our thoughts turned to Christmas, I asked what she might want for a gift. She asked if I would write her a story. One we could read together. And, with that one simple request, everything changed. Little did she know that she was the one who had given a gift to me. I was writing again. A children’s story. I truly had no aspirations to seek an agent for this work, nor to have it published. My goals were far more modest but at the same time all the more important. I simply wanted to finish a story for my daughter. I met that first deadline and my family gathered around the fireplace on Christmas Day as I read what would become the first chapters of my next novel. It was called The Luck Uglies and I completed it over the next three months, one chapter per week, each read aloud by the fire to my enthusiastic audience. When the manuscript was done, those old aspirations started to creep back into my mind. Dreams die hard I suppose. Either that or I’m a glutton for punishment. But this time things ended differently. As I write these words, HarperCollins has published The Luck Uglies in the United States and the United Kingdom. A Norwegian language version is in the works. It’s humbling to think that families around the world may soon be reading my little story around their own fireplaces. I never dreamed of writing books for children. Now I can’t imagine writing books for anyone else. As strange as it sounds, I am fortunate that my first novel was never published. I’m grateful for that twist of ugly luck so many years ago. For those of you with similar dreams and aspirations, I wish you good writing, thick skin, and your own dose of ugly luck in unexpected places.